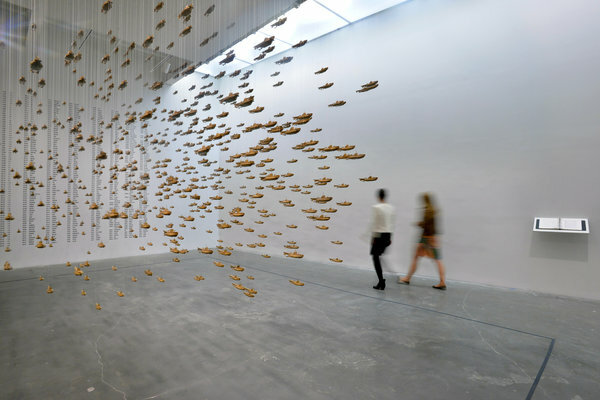 “Chris Burden: Extreme Measures” at the New Museum is a superb survey, but also a kind of transfiguration. It liberates the Los Angeles-based Mr. Burden from the clutches of history, expanding and rebalancing our understanding of his art. This is the first American solo museum exhibition of Mr. Burden’s work since 1988, and his first in New York. It recasts his influential performance pieces from 1971 to 1977 — part of the “dematerialization” of the art object — as innovative yet searching early work, while making it clear that his subsequent sculptures are of a piece with them. All his work shares a single-minded drive to examine the facts of life, whether social, psychological, physical or natural, with an emphasis on outer limits: on tolerances pushed to but never beyond breaking points. In his sculpture, there is a recurring emphasis on war and its instruments, usually to make a case for peace. It helps that Mr. Burden’s stark yet invigorating vision is undaunted by the dour galleries of the museum’s 2007 building. His often massive, sometimes quasi-industrial sculptures alternate with intricate installations and structures consisting of many small parts. All seem to thrive equally against the cellblock décor of boxy proportions, concrete floors and window-free walls. Some works repurpose ready-mades: a whole car or a large flywheel salvaged from a New England mill town. Others involve laborious, almost obsessive, building or arranging. Three large, triple-arch, model bridges celebrate the human ability to collaborate with the laws of gravity and the facts of strength and weight. Two of these are assembled from metal toy construction parts with many screws. The third, and the most amazing, is built entirely from hand-cast, whitish concrete blocks and several essential cylinders — whose structural versatility becomes especially clear. 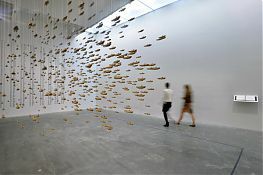 A fishlike school of 625 small, handmade, painted-cardboard submarines, suspended on monofilaments from the ceiling, has a lyrical beauty, while representing all the submarines built by the United States Navy up to the making of the piece, in 1987. Perhaps most memorable is an immense diorama, “Tale of Two Cities.” It uses 5,000 toys, more than 20 tons of sand and live plants to convey both the spectacle and the horrible waste of two cities locked in battle at the edge of a jungle — while also offering a random, but extensive account of the history of toys. Mr. Burden, the son of an engineer and a biologist, was born in Boston in 1946 and grew up in Cambridge, Mass., and Europe. As an artist, he was fast out of the gate, establishing his reputation with a series of exquisitely simple, often incendiary performances from 1971 to 1977. Many lasted only a few seconds, others for up to three weeks. But they tested will, discipline and endurance, sometimes to the point of real danger. He started his run by spending five days folded into an art-school locker (2 by 2 by 3 feet); in another, he was shot in the arm with a rifle, to juxtapose real-world violence with the staged violence of television; in a third, he spent three weeks in a bed in a gallery, barely moving and never speaking. Few people saw Mr. Burden’s performances, but no matter: the best of them could be reduced to a vivid sentence or two that, once heard, stuck in the mind. By the mid-1970s, they formed a familiar litany of indelible acts and documentary photographs. After 54 performances, Mr. Burden succumbed to performance art’s primary occupational hazard: It was too grueling. He had always considered his performances sculptures, and now he turned to making sculptures that he saw as performances: feats or demonstrations that delved more deeply into reality with forms other than his body. His art-world visibility shrank because his efforts could no longer be distilled to an unforgettable sentence or two. They had to be experienced directly, which is what the New Museum’s spacious exhibition is all about. With documentation of Mr. Burden’s early performance work consigned to the museum’s small fifth-floor gallery, the exhibition unfolds on the lower floors, each with two to six works that effectively contrast scale, process, materials and meaning. For example, the two works on the fourth floor use ready-mades to meditate on movement, inertia, stasis and energy. One, “The Big Wheel,” from 1984, is a David-and-Goliath collaboration that joins a large, rusty cast-iron flywheel (eight feet in diameter, three tons in weight) with a small 1968 motorcycle. When the motorcycle runs for three or four minutes, its revolving back wheel sets the flywheel spinning madly. The cycle’s noisy motor is then turned off — delivering a wonderful shock of silence — and the big wheel’s kinetic energy is such that it continues to spin for about 90 minutes, emitting a quiet hum and soft breeze as it gradually comes to a standstill. Nearby, the 2013 “Porsche With Meteorite” demonstrates another kind of reciprocity, between two forms that have almost nothing in common. Suspended from opposite ends of a graceful, telescoping balance beam of velvety rusted steel are a beautifully restored 1974 Porsche, a luxury item par excellence, and an equally exotic natural feat: a small meteorite so dense it resembles solid bronze. They balance perfectly, like a Calder stabile, with the heavier Porsche much closer to the vertical support. Their elevation off the floor makes their marked differences and details easier to examine and appreciate. On the third floor, the constructed tensile elegance of Mr. Burden’s model bridges contrasts with two bulbous instruments of destruction: re-creations of a pair of squat walrus-size 18th-century cannons and large stone cannon balls, a combination that, like the bridges, are extremely satisfying as sculpture. The theme of destroying continues on the second floor where the warring diorama of “Tale of Two Cities” shares the main space with “America,” the school of submarines, evoking grown-up war in intricate, tenderly wrought miniaturization. This exhibition has been overseen by Lisa Phillips, the New Museum’s director, in collaboration with its associate director and director of exhibitions, Massimiliano Gioni; Jenny Moore, a former associate curator who is now executive director of the Chinati Foundation in Marfa, Tex. ; and the curator Margot Norton. But it is very much Mr. Burden’s show, right down to the first-person explanatory wall texts. He has also converted the New Museum’s stacked-box exterior into a pedestal of sorts, attaching a beautiful 30-foot handmade fishing boat to the front, where it looks a bit, well, marooned. And on top of the building are a pair of 37-foot tall skeletal towers that don’t do much except rather gratuitously evoke the World Trade Center. The sight of the beams splashing into the concrete and crashing into one another is heart stopping. The final work is, each time, a haunting tangle of vertical, leaning, crisscrossing and fallen beams at once beautiful and cruel. It is an Abstract Expressionist earthwork that suggests an especially articulate antiwar memorial and may remind some viewers of the shardlike ruins of the fallen towers of the World Trade Center. Like several other works in this often moving exhibition, the chaotic mass can be read as a plea for building rather than destroying, and for peace. “Chris Burden: Extreme Measures” is on view through Jan. 12 at the New Museum, 235 Bowery, at Prince Street, Lower East Side; (212) 219-1222, newmuseum.org.